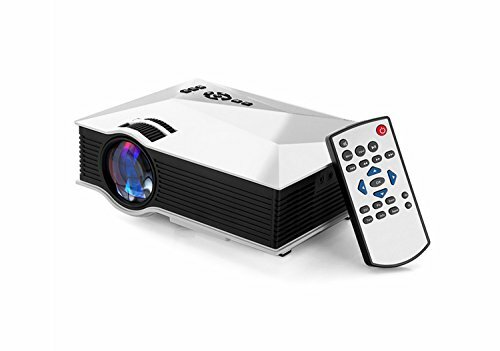 Due to the copyright issue of Dolby, this projector does not support Dolby's Audio decoding (Close the Dolby option of the device you connected), or you might not get sound from videos. Especially when you watch Netflix. Brightness: 1200 Lumens, Native Resolution: 800*480P, Contrast: 800:1. Image size 36-130 Inches(Recommend Distance 8.0 ft, best Projection Size: 80-120 inches),not recommended for PPT or business presentation, ideal for home theater movies and video game use. Portable design, easy to take and travel. Great for outdoor movies. Usually, when the projectors works, the fan will make noise to Radiating due to the highly temperature. It will be better that you can have a break after 3 to 4 hours using to avoid overheating. Support: Multi-media (Music, Picture, Video, TXT); Connect your PC/Laptop/DVD Player to enjoy videos or movies. Connect PlayStation 3/4 or XBox ONE Wii via HDMI port to enjoy games on so big screen! Enjoying watching movie and football game in the living room, also applying to courtyard or outside.